Meek the possum and her sisters three are happy living in the sprawling paperbark tree - until the day Squabbles the bat moves in. A story about sharing and making friends. Meek lives with her three sisters, a gaggle of birds, lizards and other creatures next to a tumbledown terr... read full description below. Meek the possum and her sisters three are happy living in the sprawling paperbark tree - until the day Squabbles the bat moves in. A story about sharing and making friends. Meek lives with her three sisters, a gaggle of birds, lizards and other creatures next to a tumbledown terrace house. Everyone shares the space, and life is pretty sweet until the day a rude and messy fruit bat named Squabbles moves in - and demands everyone else move OUT. Will Meek be able to get rid of Squabbles, or is there a way for everyone to get along? 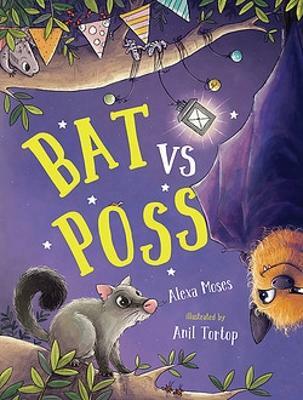 Alexa Moses's lively rhyming text is entertaining to read aloud and Anil Tortop's illustrations are full of terrific detail and great characterisation. 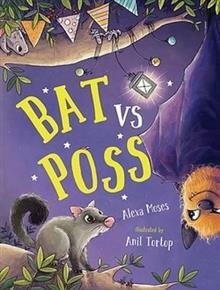 BAT VS POSS is a fun story about learning to share that kids aged 3 to 5 will want to read over and over. 'Anil Tortop's illustrations are, again, simply stunning. Her work is colourful and vibrant, and has a magical ability to draw your eyes from across the room.' Kids' Book Review on Anil Tortop's DIGBY AND THE YODELAYHEE... WHO? Tortop's illustrations add another layer of charm to this already charming book. The endpapers are a fascinating study in footprints, the characters are endearing, and the animals full of movement. Her real strength, however, lies in the way she uses different viewpoints and different light sources to attract and engage the reader. Our view shifts from birds-eye (how appropriate! ), to down below, from close-up to long shot. The light of the fire and the birthday candle seem to really radiate warmth off the page. - CBCA Reading Time on Anil Tortop s The Great Zoo Hullabaloo The Leaky Story has quickly become a favourite in our household. The illustrations are brightly coloured with lots of action. - CBCA Reading Time on Anil Tortop's The Leaky Story Anil Tortop has done a stellar job of enhancing the text through its translation. - Kids Book Review on The Leaky Story Anil Tortop's illustrations are, again, simply stunning. Her work is colourful and vibrant, and it has a magical ability to draw your eyes from across the room. I love that every page has a different, brightly coloured background, and I can't rave enough about the simple yet detailed expressions Tortop creates to convey the curiosity, astonishment and delight the characters experience throughout the book. - Kids Book Review on Digby and the Yodelayhee... Who? Alexa Moses (Author) Alexa Moses has a masters degree in screenwriting from the Australian Film Television and Radio school, and has written for children's television including hoopla doopla!, The Woodlies, Gasp the Goldfish and The Davincibles. She also worked as a journalist at the Sydney Morning Herald for six years. Alexa won the Varuna HarperCollins fellowship for her first manuscript, and has had two middle-grade novels published by HarperCollins. When she's not reading and writing, Alexa spends her time knitting, cooking, watching sitcoms and listening to maudlin pop music. Anil Tortop (Illustrator) Anil Tortop was born and raised in Turkey. She moved to Australia in early 2011 and has been trying to get used to the local eight-legged house intruders and slithering visitors to her garden ever since. Anil has illustrated 16 children's books and also works as an animator and character/concept designer. Nowadays, Anil lives in Brisbane with her husband.